The laboratory offers analytic services for research projects, student papers and theses as well as student internships. Classes offered here demonstrate the modern analytic methods in practice to students. Of course, the entire portfolio of services is also available to external clients such as public institutions, companies and private individuals. 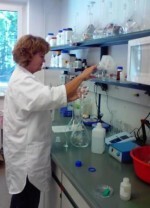 Our laboratory specialises in chemical, biochemical and physical analyses for forest and environment-related studies. studies in the field of organic analytics and genetics (identification of phenols, pigments, ascorbate, starch, proteins, vanillin, cyanidins, amino acids and isoenzyme analysis etc.). Cutting, ultra-centrifuge, mortar grinders and sifting machines are available for plant and soil treatment. A wide range of plant and soil samples can be chemically broken down efficiently using digestion apparatus (Behr and Loftfield). Multiple extraction systems are also used. The laboratory is equipped with modern analysis devices (conductivity meter, pH meter, titrators, spectral photometers, atom spectrometers (ICP-OES, graphite tube AAS), ion chromatograph, elemental analyser for C and N analysis). The entire laboratory team has expert qualifications and many years of experience in soil, plant and water analytics, in particular for forestry matters. All studies are carried out thoroughly to national and international analytic standards. The laboratory regularly takes part in national and international round robin tests and is certified for laboratory analyses as part of the nationwide Soil Condition Survey (BZE II) and in corresponding European programmes such as Bio Soil and FutMon. The laboratory has been affiliated with the university since January 2005. Developed from the former laboratory of the Eberswalde State Forestry Department, which had previously been the Department of Timber Chemistry and Analytics at the Eberswalde Forestry Institute, it possesses great expertise and many years of experience in analysing plants, soil and water. Every year, roughly 1500 plant, 3500 soil and 1000 water samples are examined. This includes commissions from the State Forestry Expertise Centre in Eberswalde (Landeskompetenzzentrum Forst) as part of national and EU research projects as well as environment monitoring programmes, projects for externally-funded university research, analyses for doctorates, bachelor and master theses, internships and other classes, analyses for the Brandenburg State Mining, Geology and Raw Materials Department, analyses for the State Forestry Administration of Mecklenburg-Western Pomerania and commissions from a range of forestry and environmental bureaus and private individuals.